Jerusalem campus pioneers new approach for treating abused children. When H. first arrived at the Haruv Children’s Campus in Jerusalem, he was an emotional wreck. Getting therapy for children is typically the parents’ responsibility, requiring them to navigate bureaucracy to obtain a referral, organize an evaluation, wait for a spot to open and schedule time for sessions. But the Haruv Children’s Campus, which opened last year to improve treatment for Israeli children who have suffered abuse or neglect, is changing that. Haruv offers occupational therapy at its 43,000-square-foot campus within a campus at the Hebrew University of Jerusalem’s Mount Scopus location, allowing H. to receive not just psychological treatment but also occupational therapy in the same place. More important, Haruv is approaching the problem of child abuse and neglect holistically -- providing services to children and their families, training therapists, and teaching other adults and professionals how to recognize and thwart child abuse. The approach could be a game changer in Israel, and other communities around the world are now looking to Haruv as a model. 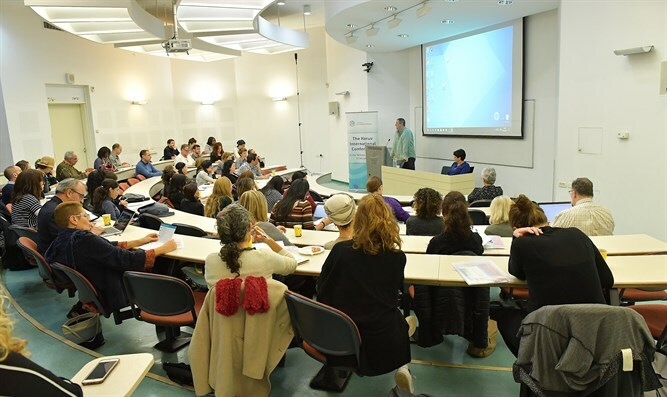 “We want to train professionals better and to develop better treatment methods,” said Haruv Institute director Asher Ben-Arieh, a professor at Hebrew University’s Paul Baerwald School of Social Work and Social Welfare and the university’s Haruv chair for the study of child maltreatment. The Haruv Institute was founded in 2007 as a training and research center. The new campus opened in January 2017 and was created by overhauling two unused dormitories and the surrounding grounds, including a distinct carob tree – “haruv” in Hebrew. Eight organizations involved in treating abused or neglected children are now housed at Haruv. The Schusterman Emergency Center for Children and Families provides a temporary home for 20 children removed from their families. Outpatient clinics treat about 100 children a day, including those with special needs. The Meital Center offers treatment for victims of sexual abuse up to age 18. Beit Lynn treats both children who have been sexually abused as well as minors who demonstrate sexually abusive behavior. The National Council for the Child, which advocates for child welfare, provides treatment and helps child victims of violence and sexual assault with legal remedies. In 2015, some 40,000 Israeli children were referred to social services due to neglect or abuse, according to a report from the council. About one-third of the children were reported for suspected neglect, one-quarter for physical abuse and 11 percent for sexual abuse. Additionally, about 367,000 Israeli children were considered at risk. For children at risk of being harmed, it is vital for the adults in their lives to notice that something is wrong and stop it. So Haruv aims not just to train professionals to provide better treatment, but also adults who see children on a regular basis, like doctors and teachers, to spot problems and take action. Goshen, a nonprofit on Haruv’s campus founded by Israeli pediatricians to help doctors assist families with children’s developmental challenges, teaches doctors to identify the circumstances surrounding abuse. “The earlier the intervention, the higher the chances of success and the lower the cost,” said Dr. Eitan Kerem, the chair of pediatrics at Hadassah Medical Center and board chair at Goshen. A Goshen workshop several years ago gave Dr. Yael Zimmerman, a family physician who works at clinics in the Jerusalem area, a chance to explain to other doctors what she experienced when she saw signs of unexplained bruising on a 2-month-old baby’s ribs. After hearing that the mother had seen a similar mark on his body the previous week, Zimmerman referred the baby to the emergency room and called ahead to say she suspected abuse. X-rays taken at the hospital showed multiple fractures. The father is suspected of abusing the baby, who has since been moved to his grandmother’s care. Ultimately, Ben-Arieh wants children who have suffered trauma to be treated exclusively by professionals trained and certified to treat abused kids because children's treatment needs are unique. For example, he noted, Haruv provides dental care because many dentists are not aware that putting foreign objects into an abused child’s mouth may trigger the trauma of sexual assault. One way Haruv is already starting to implement Ben-Arieh’s vision is through the occupational therapy clinic, where Stav Dekel-Amir, who heads the occupational therapy division, has helped H. and his parents figure out which situations distress him. His parents have been given tools to help H. soothe himself by manipulating rice-filled socks and heavy balls. All told, over 80 percent of the Haruv campus’ cost came from the Charles and Lynn Schusterman Family Foundation and the American Jewish Joint Distribution Committee. Other donors included the Wohl Legacy, Israeli municipal and government sources, and two other family foundations. In addition to its work in Israel, Haruv is exporting its model internationally. Haruv USA, based in Tulsa, Oklahoma, is working with police and local government agencies to provide training on child abuse and neglect, and with Jewish communities in Oklahoma, Maryland and Colorado to provide guidance on recognizing signs of child abuse. The group is also planning to train counselors and American Jewish youth groups and summer camps. Haruv also run workshops for rabbis from the Conference of European Rabbis, trains social workers from Germany and South Korea, teaches youth workers in Madagascar, and provides training sessions for parents in South Africa on parenting methods.